The creation of a rug is approached by many different methods, depending on materials used, cost-effectiveness, desired texture, design, and overall look. The types of construction include: hand-tufted, hand-knotted, loop-hooked, machine-woven, flat woven, braided, and indoor-outdoor construction. To create a hand-tufted rug, a pre-woven foundation is chosen or cut to size, and threads of yarn are pushed through that foundation with a tool like a sewing needle. Once the tufting is finished, the loops of yarn are carefully sheared, which creates a plush pile tailored to be whatever length (or pile) the designer required for that particular rug. Finally, a backing is applied to finalize and stabilize the weave. Hand-knotted rugs are basically a specialized art form similar to petit point embroidery. Individual threads of yarn are looped on to warp threads and knotted into place. A very time-consuming, exacting process, some large hand-knotted rugs can take more than a year to produce. 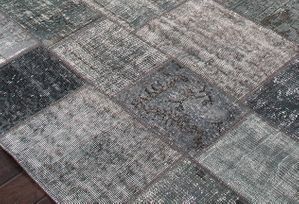 To produce a loop-hooked rug, a process very like that for a hand-tufted rug is employed, but instead of shearing the loops, they are left intact, producing a nubbly texture that can offer distinct textured forms, or can be very much even-textured. Sometimes a combination of loop-hooked and loop pile--which cuts the loops, offers uniquely textured possibilities. Machine woven rugs are produced on mechanical looms, which insure evenness and consistency, with the back and front of the rug being woven simultaneously. The benefits of machine weaving include good pattern definition and distinct separations that give clear demarcations on designs. Braided rugs are pretty much exactly what they seem to be. A continuous rope is produced by braiding fabric or yarn, and then is coiled or shaped around itself to become a braided rug. Most are in rounds, ovals, or rectangles, and are usually reversible, as the rug is the same front and back. Wool: Because wood is naturally dirt and stain resistant, regular vacuuming will keep your wool rug looking great for a very long time. When you feel the time has come that you need to take more in-depth cleaning measures, use only cold water to avoid shrinkage. Immediately blot any spills then gently clean with soap and cold water. Do not use any oxygen-based cleaners (hydrogen peroxide, Oxy-clean, etc.) on wool, and keep wool rugs out of direct sunlight as much as possible as they will fade. Periodically, professional cleaning is recommended for all wood rugs to bring back that bright, new-looking color. Silk: Regular vacuuming is one of the best ways you can maintain your silk rug, as it prevents a build-up of soil and other particulate matter, which would wear into and damage the silk fibers. Avoid allowing your silk rug to become saturated with water as it would damage the fibers, and, if you must clean a spill, blot it immediately, then carefully clean with mild soap and cold water, pressing it as dry as possible to finish. Professional cleaning is recommended on a periodic basis to keep your rug looking new and to protect the silk fibers. Natural fibers: Highly absorbent, these natural fibers such as hemp, jute, bamboo, or cotton are prey to dirt getting trapped in the fibers. Consequently, regular vacuuming is one of the best ways to protect these fibers. Using a vacuum cleaner without the beater bar protects these rugs from having the individual fibers frayed, which will eventually show as fraying of the carpet. These rugs should never be steam-cleaned because of the absorbent quality and the fact that it could cause shrinkage. Instead, suction cleaning or dry-extraction cleaning is recommended. Periodic professional cleaning is recommended, and these rugs should be kept away from direct sunlight as they will fade. Synthetic rugs: So many different combinations of synthetics are available these days, but all of them should be fairly dirt and stain resistant, and should look great with regular vacuuming. Steam cleaning works very well on most synthetics as they dry very quickly and the steam releases dirt from the fibers. Spills should be blotted immediately, and carpet cleaners that are safe on synthetic fibers will go a long way toward keeping your rug looking wonderful. Keep out of sunlight to avoid fading, and periodic professional cleaning is always a great way to give the rug a longer, beautiful life. When dealing with specific textures of carpet, you might consider that if you have twisted knot construction or loop construction you might set your vacuum beater bar to very high, or turn it off completely, as it will tend to catch and pull on the fibers, which will eventually result in their being damaged. If a loop does pull away or tear, you might use scissors to trim that loop to match the height of the others in the rug. Similarly, if a strand frays or tears, even it up with the others by cutting with scissors.